Taking Yourself Too Seriously? 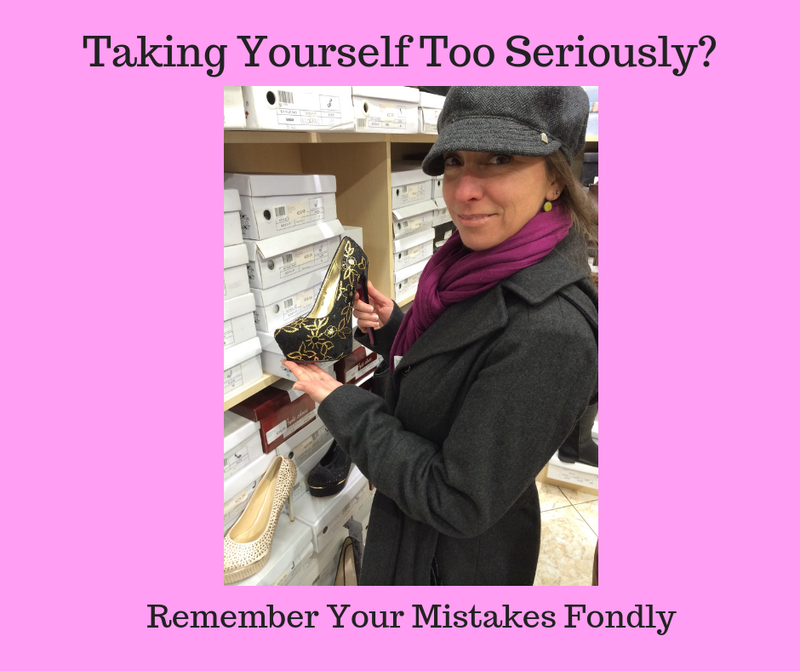 Remember Your Mistakes Fondly. It was my first day of my first real job out of college. My paid internship in Washington DC had ended and I spent the summer playing with my sister and roommate, waiting tables and hosting at a couple of restaurants. When my sister moved back home to Colorado, my roommate convinced me to join a temp agency. Shortly after my first placement, the company offered me a job. My appointment with Lori in the HR department was scheduled at 8am on a Monday morning. It was December, and it was still dark when I woke up, eager to go to my meeting, fill out paperwork, and start my job with the Meetings Department at the American Chemical Society. I dressed in the dark and popped my head into my roommate's bathroom to say goodbye, she said "good luck, Sarah!" It was still dim outside as I made my way from the apartment to Union Station to catch the train. I sat for the few stops to the Farragut North station and held my little briefcase, a graduation gift from my dad, on the tops of my feet. In my eagerness and anxiety, the long escalator ride to the surface seemed even longer than usual. As I stepped off the escalator, out from under the awning and onto the sidewalk, I glanced down at my feet. I looked back up and took a few more steps. I thought, "Oh no, I wouldn't have done that." Looking back down at my feet confirmed my initial observation: I was wearing two different colored shoes. One was black, the other was navy. They were identical pumps -- except for the color, which, now in full sunlight, was obvious. Walking into the first office building on my left, I marched with confidence toward the tall counter as the man at the desk behind the counter looked up. May I please use your phone? No ma'am. This is not a public phone. Good morning, Lori. I'm on my way over now, only a few blocks away, but I have to run home so I'm going to be late. Why? Well... I just noticed... I'm wearing two different colored shoes. ... No, I know I can't come to work like that. ... Yes, just about 30 minutes. ... Yes, I'll be there. Thank you. I hung up the phone and the man at the counter stood to pull the phone back down to the desk so he could peer down at my feet and grin. Smiling back and thanking him, I ran back to the Metro station. I found myself grinning, feeling very silly, and trying to cover my shoes with my briefcase when I sat down on the train. I managed to get home, change a shoe, drive back to the office, pay an outrageous price to park the car near the building, and get to the HR office in 30 minutes. When I told my roommate the story over dinner, we couldn't stop laughing. Our stomachs were sore from the deep belly laughs that night. She reminded me of a few other little details I managed to mess up over the previous few months and came up with a term for those, "Sarah-isms." Those small details add up in similar ways to what I described in an earlier post about finding multiple Band-Aids on my hands. The difference here is that these little details are silly, not dangerous. Stories like these are great reminders that we are human, we are fallible, and that while it's important to take our jobs and responsibilities seriously, we should never -- ever -- take ourselves too seriously. After all, we are all human, no matter how high the pedestal on which we may stand or be placed. Just a few years after the two-different-shoes incident, I was in Vancouver, Canada, for work. My colleagues and I took an afternoon to rent a car and drive up to Whistler to explore. It's a beautiful ski resort not far from the city; it reminded me a lot of Vail, Colorado. We were there in the spring and the hills were covered in beautiful green grass and wild flowers. A small boutique store back then, Joe Boxer happened to be open that day. Joe Boxer was the brand that got big and famous, thanks to Forrest Gump and his yellow smiley face. At the time, it was a higher-end brand (now you can find it at KMart) and all the rage. I picked out a watch with a brown leather band and smiley faces in place of the numbers on the face. For my husband, I picked a fancy silver one with the smiley face imprinted in the face of the watch. You could only tell when you looked closely at it. Wearing that watch as a DC professional, as a consultant implementing a major software program in agencies like the Federal Reserve, World Bank, and NSA, kept me grounded. When I found I was taking myself too seriously, all I had to do was look down at my watch. A smile would begin from my wrist and work its way up to my face, guaranteed. DC has far too many people who take themselves far too seriously. They didn't need one more.